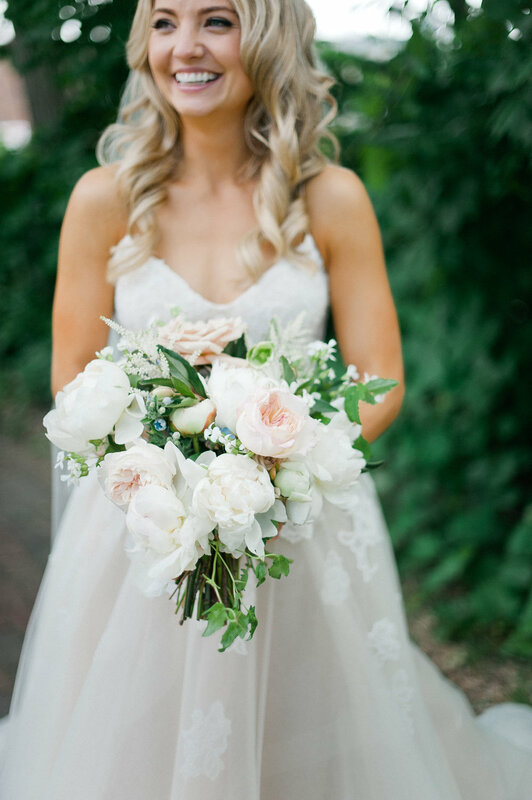 Kelsey and Kyle’s wedding was a lush floral dream at Orchestra Hall in downtown Minneapolis. With ample natural light and a sleek modern architecture, warming the space up with our floral gave the space an intimate feel, including draping the ceiling with 50 foot garlands. Their wedding is a perfect example of one of our favorite tips - get creative with reusing your flowers! Their bowls had a first life anchoring the aisle on acrylic stands, and then during the flip had a second life as table centerpieces. As well, the bridesmaids bouquets doubled as table centerpieces for the candle looks, giving some extra color and texture. These tricks are the perfect way to get ample use and tie the ceremony and reception together, and if Sadie’s ladies are coming back for a room flip, why not? !